February 4, 2014 Is this the greatest work of all time? One thing I learned during my first day on the job at WWE last summer, was that the company honestly doesn’t mind getting negative fan feedback on social media. Whereas most companies work hard to get as much positive reaction as possible, WWE is in the business of keeping people interested in their stories. To do that, they need to piss people off, then give them what they want, then piss them off and so on. People who are incredibly upset and outraged over the storyline in which WWE treats Daniel Bryan like dirt are probably still going to tune in to see what happens. It’s only when people are bored with the product that they turn it off. So, igniting passions either way is a win for WWE. That strategy would seem to indicate that the Daniel Bryan not being in the Rumble was a “work” (or, part of a storyline, usually designed to look “real” to the average viewer). Of course, the WWE has a spotty track record with actually executing these stories that dance on the line of “real” and “fake.” More often than not, fans can tell what is fictional, what’s being set up, what might happen next. The fact that fans got so worked up over the Bryan situation means that WWE either did a hell of a job making the snub look real or lucked into a situation where a booking mistake sparked a lot of outrage and attention on the product. Either way, what happened (and the fan reaction) is now part of the fictional story line. The situation with CM Punk is a bit different. WWE has made no mention of Punk or the developing “Punk quit” story. Nothing on the website, nothing on the TV shows, nothing on social media (aside from the curious mutual unfollowing of the @cmpunk account and @wwe). Actual news outlets have covered the story, but WWE’s own “news” writers have been silent. CM Punk is not featured on the website in any special capacity at this point, but his profile is still up and there’s still some evidence of his existence (unlike the blackout of Chris Benoit–who is never, EVER mentioned by the company). Last night on the live RAW broadcast, the crowd was very clearly muted by the production team, although several Punk chants were audible at various times. 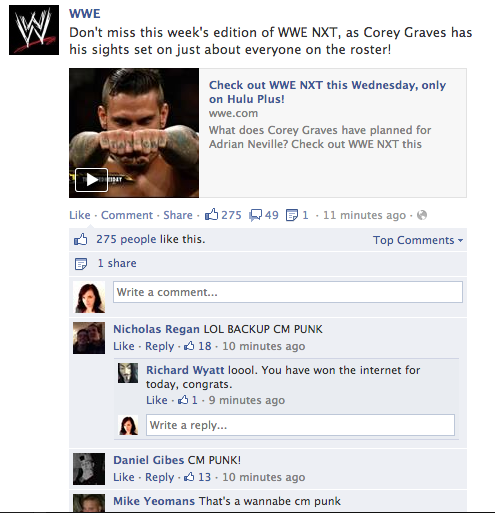 As WWE continues to post their usual Facebook updates and articles, fans continue to comment about Punk. The company remains silent. CM Punk remains silent. Is it possible that this is one of the most effective “works” of all time? That WWE somehow found the ability to capitalize on the situation by NOT saying a word? Because by not commenting or even mentioning the story, it’s not going away. And that’s actually a good thing for WWE. Unlike most companies, they never want to sweep something under the rug (with the notable exception of Chris Benoit), even if it could be perceived as negative. The story could be real AND a work. In other words: CM Punk could have legitimately walked away last week. WWE simply decided to create more interest in the story by not telling it themselves, by letting it play out in internet speculation and fan outrage. By confirming that “CM Punk left our company” WWE would be closing off storytelling possibilities. The certainty of such a statement would deflate the story. Punk’s fans might not bother to watch during the lead up to Wrestlemania. By saying nothing, the door is left open to any possibility, including a shocking return at any moment. Instead of fans simply expressing their displeasure with the fact that Punk is gone, now they are doing that AND complaining about WWE’s silence. Well-played, WWE. We get that you are consciously stoking the flames here. When RAW comes to Punk’s hometown of Chicago in a few weeks, I suppose we’ll know whether or not this was just an elaborate ploy to get the man some vacation time. If the quitting is legit and Punk doesn’t return in Chicago or at Wrestlemania, the story will be over, but at least they’ll have a couple months of intrigue leading up to their biggest event of the year. The smartest thing they can do right now is to show restraint and do nothing. The audience will lean in when you whisper, not when you shout.